Home / Editor's Choice, Entertainment News, Featured Articles, Gossip and Drama / Dr OFWENEKE’s ex-wife, NICAH, almost removes everything to show her voluptuous hips, Looks like sponsor hunting mission, LOL!! Dr OFWENEKE’s ex-wife, NICAH, almost removes everything to show her voluptuous hips, Looks like sponsor hunting mission, LOL!! 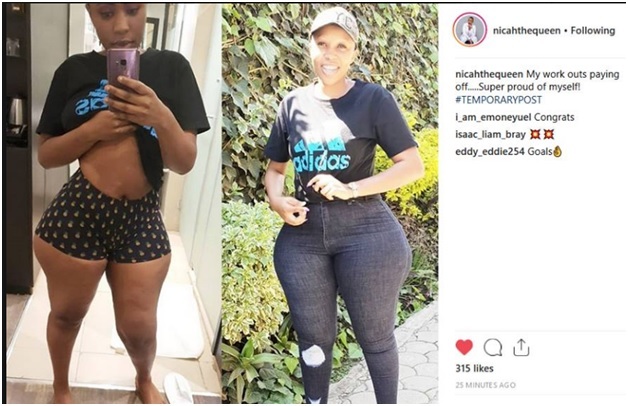 Thursday, February 14, 2019 - Dr Ofweneke’s ex-wife, Nicah The Queen, stunned her followers on Instagram after she rocked a tiny short and showed off her voluptuous curves. The mother of two who was once linked to a sexual affair with Tanzanian singer, Harmonize, claims she has been busy working out in the gym. She wanted to show the results of working out and how she is almost getting a flat tummy, and probably lure a sponsor somewhere to pay bills. Don’t forget she is a gospel artist who behaves like a socialite. Check out the photo she posted.